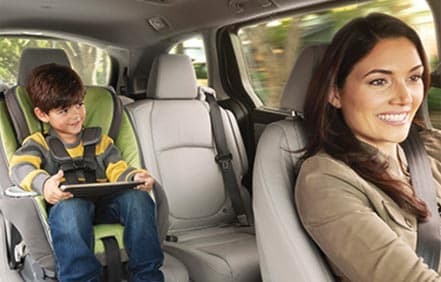 The innovative 2019 Honda Odyssey is not just a car – it’s a lifestyle. Combining comfort, great performance, and style, this minivan is an ideal selection for families. Experience the 2019 Odyssey Minivan by visiting Manly Honda for your test drive. Located in Santa Rosa, CA, our team members are ready to get you one step closer to your dream vehicle. Experienced, knowledgeable and passionate about what we do - we take pride in being a reliable, full-service dealership for drivers of Rohnert Park and surrounding areas. Your driving experience in the new Honda Odyssey starts with only the simple touch of the door handle as it unlocks beneath your fingertips thanks to the available Smart Entry with Walk Away Auto Lock® feature. The manufacturers of this model really focused on designing a well-rounded, safe, and luxurious option for all families. Drivers will smoothly cruise around town in style with available 19-inch alloy wheels, intelligent LED headlights, modern exterior and customization possibilities. At Manly Honda, we can help you and your family drive home in a minivan that truly excites as well as it energizes. Visit our Honda dealership near Petaluma today to experience it for yourself. The Honda Sensing® system ensures the safety of you and your family so that peace of mind can be enjoyed with every ride. The Collision Mitigation Braking System (CMBS) does an amazing job bringing your vehicle to a stop when a frontal collision is possible. The Road Departure Mitigation System (RDM) safety feature keeps you from driving off roadways by providing steering assistance that helps you get back in your lane when you’ve accidentally crossed over detected lanes. Without a doubt, you can be confident to cruise around in the 2019 Odyssey as well as any of our other new Hondas for sale. The Odyssey truly takes fun, connectivity, and comfort to a whole new level and it’s also available in several stunning colors including white diamond pearl, deep scarlet pearl and obsidian blue pearl. The interior of this minivan delivers just as stunning an experience as its exterior. With a stunning, easy-access available moonroof, you and your crew can enjoy the outdoor wind as it immerses the cabin as well as spectacular views. Visit us today to browse through our new and used dealership options. Passionate about what we do, our expert team can help you find your dream vehicle today with the stress-free car-shopping experience you deserve. The minivan that you and your family have been waiting for is finally here. With the push of a button, you’ll be on the road to great places. Features including the power sliding doors, Apple CarPlay®, and Android Auto™ Integration and hands-free access to your back-cargo space mean your ride is as innovative as it is convenient. You can’t go wrong with any of our new Honda vehicles – swing by today for your scheduled test drive of the 2019 Odyssey and learn more about our new cars for sale in and around Santa Rosa. Our teams here at Manly Honda are here to support you in any of your automotive needs!